It’s another drizzly, early spring morning in NYC – in December. This is the second consecutive year where we appear to be gearing up for a relatively mild winter, and cries of global warming fill the holiday air. Next year when we’re under 13 feet of snow we’ll see just how committed people really are to this notion (which is real nonetheless), but for now, this winter-hater is living it up. Me and the robins. The formerly migratory, not-going-anywhere-this-year-thank-you robins. I remember a similar stretch of mild weather from some years ago: the winters of 1990-91 and ’91-92, if I’m not mistaken. We enjoyed thunderstorms, occasional 60-degree days, and scant snowfall. And when you’re schlepping through the city to ship crap nobody wants across the country or trying to get to various and sundry appearances, it’s a lot easier when you’re not scrambling over crusty mounds of blackened ice, or leaping over foot-deep brackish puddles (and almost making it). Big-picture thinking doesn’t make the occasional disaster or societal horror any less devastating, but our pattern-seeking brains need to be reminded that there’s a lot that’s beyond our control. Which may be why we find ourselves talking about the weather so much. Especially now. Merry Myth-mas. It’s not about you. PS – There’s more info on the Performance page, but come check out The Rehearsal Room this Wednesday (12.19) to hear songs from the new project I’ve been working on with The Lindsay Mendez! 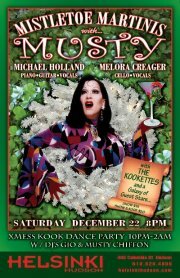 And this Saturday (12.22), I’m up in Hudson NY for Mistletoe Martinis with Musty at Club Helsinki! And happy holidays, for real. This entry was posted in Appearances, Blog, Music, Musicals, News and tagged blog, global warming, holidays, lindsay mendez, michael holland, Mistletoe with Musty, musty chiffon, Rehearsal Room, Ryan Scott Oliver. Bookmark the permalink.